Recommended reading if you are tracking the Boston residential real estate market. Check out the write up for my favorite neighborhood, South Boston. Click for the complete Compass' 1Q17 Boston Market Report. We are excited to announce the release of the Compass' 1Q17 Boston Market Report. This report highlights the prevailing trends shaping the market from this past quarter and provides a glimpse into the research and data analytics in which Compass prides itself. The condo market in Boston is off to a strong start in 2017. Inventory increased 15.9% year-over-year to 1,778 units and median asking price increased 10.2% year-over-year to $799K. The number of sales increased 8.3% year-over-year to 787 closed transactions. 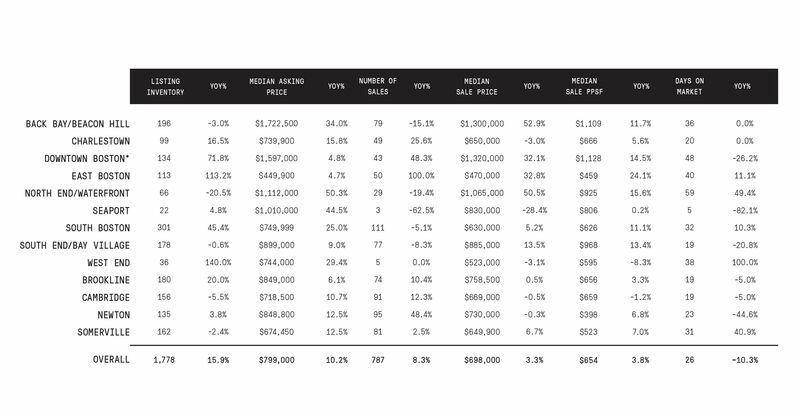 South Boston had the highest number of condo sales with 111 units this quarter, accounting for 14.1% of all condo sales this quarter. Demand for two-bedroom and especially three-bedroom condos was strong, as the number of sales increased 10.6% and 29.9% year-over-year, respectively. Median sale price rose 3.8% year-over-year to $698K. Despite a slight year-over-year decline of 0.7% for two-bedrooms, median sale price in all other bedroom categories increased compared to the same quarter last year. Condo overall median days on market decreased 10.3% year-over-year. The single family market in Boston experienced a decrease in both inventory and sales this quarter. Available listings decreased slightly by 0.9% year-over-year to 418 homes while the number of sales decreased 3.3% to 148 closed transactions. The drop in the number of sales was primarily led by the 53.3% year-over-year decrease in Somerville and the 37.5% year-over-year decrease in Cambridge, where only 7 and 10 homes sold in Q1 2017 respectively. Median asking price increased 7.8% year-over-year to $1.4M while median sale price decreased 6.1% year-over-year to $1.15M. Brookline and Newton achieved the highest number of sales in the first quarter, with 21 and 71 homes sold respectively. Single family overall median days on market was 40 days, the same as the first quarter last year.